Being a southern state, Kentucky has very warm summers. Although the region experiences four different seasons, the winters are quite mild. Still however, there is the risk of periodic ice and snow in the winters. Additionally, tornadoes and wind storms are also possible weather hazards experienced in this part of the country. Energy savings. Using a metal roof will aid in keeping your attic cool and consequently your home much more comfortable in the warmer months. The results are lower bills and potentially an EnergyStar tax credit. Steel roofing is lightweight – typically lighter than asphalt shingles. Able to endure heavy snow and wind speeds of up to 120 mph. Much of the roof is constructed using recyclable metals. Environmentally friendly, the roof can also be recycled at the end of its life. Looking for metal roofing in Kentucky? Choose the best style, color or application for your individual project. We also offer a number of options for lower budgets. Simply contact our customer service department for assistance. Our company services every community in Kentucky – small or large. And, your entire order is conveniently delivered to your work site. 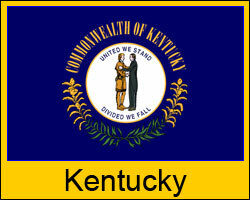 Check out our list of prices for Louisville, Lexington, Paducah and all other areas in Kentucky. Some shipping restrictions may apply. Click here for details on shipping to your job site.